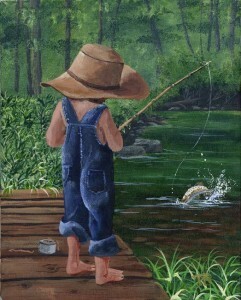 Do you like to go fishing? Have you ever been fishing all day without catching anything? 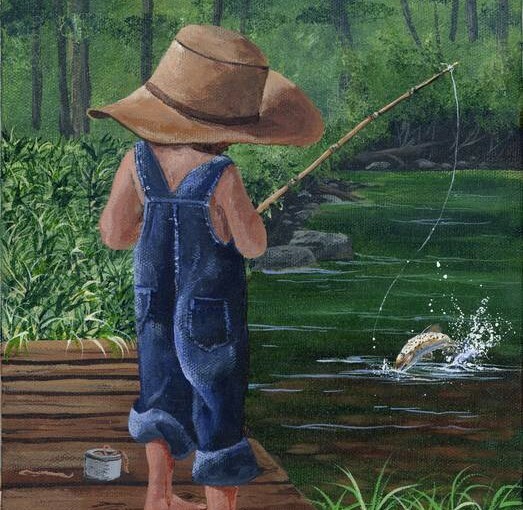 Everybody knows the old slogan “A bad day fishing is better than a good day at work!” When I was a boy, during the summer break from school, Mom would gather up us kids and take us to Grandma’s and Granddad’s for the summer. They had a farm with plenty of fresh air. Now Grandma struggled trying to keep me occupied with something to do. I enjoyed taking things apart and trying to put them back together again, usually with fewer working parts, so she found it best to keep me within eyesight! Grandma Hazel loved the outdoors. She had a garden as big as this church’s parking lot. I am not exaggerating because I knew it well. You see, us kids didn’t have Sponge Bob, text-messaging or Nintendo games to occupy our time with. We snapped beans, shucked corn and pulled weeds. So I knew the garden well! 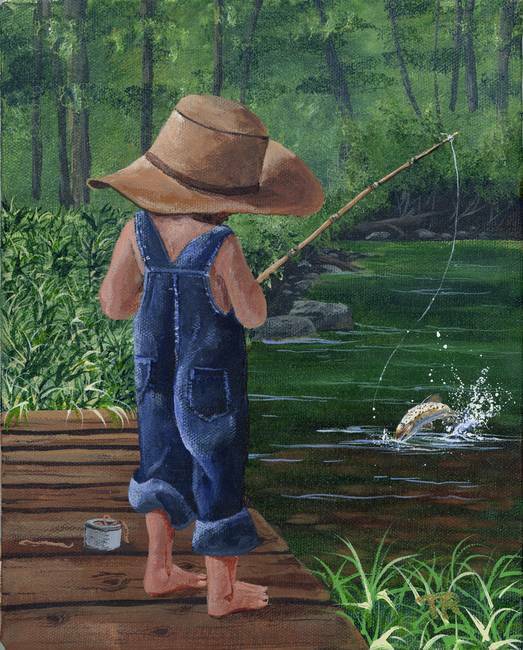 About once a week, after all the farm-hands had been fed their lunch, Grandma Hazel would take us kids fishing. She would put on her wide-brimmed gardening hat, and cut some willow branches from the old tree. She would take a thick black piece of thread and tie it to the willow pole and attach a hook. Grandma kept her hooks in an old baby food jar in a drawer in the kitchen. She would then get a can and a shovel and take us kids out to the compost pile to collect the bait. Fish aren’t stupid; you have got to have good bait! So we only gathered the wiggly worms with a lot of life in them! Once we gathered all the necessary items, down to the pond we went, making our way through the gates and barnyard to the big pond. We always caught fish. Grandma had stocked sun perch in her pond and they were thick as flies at a picnic. I always liked to see how many fish I could catch using the same piece of live bait! I discovered that the worms that wiggled more caught more fish! We would release the fish we caught back into the pond except for the ones that were injured; we would feed them to the cats. Farm cats aren’t fancy and they knew a good meal when they saw one! The Church has given us the tools we need to catch fish! Our fishing pole is the wisdom of the Holy Scriptures and the guidance of the Holy Fathers. Our fishing line is the lives of the Saints, the order of our church services and the life that we practice in Orthodoxy! Everybody probably can guess what we use for a hook. It is the death and resurrection of our Lord Jesus Christ! Now that just leaves the bait, everyone look in the mirror; you are the bait! How do we become good bait? Saint Maximos the Confessor said: “The one who loves Christ thoroughly imitates Him as much as he can.” We must embrace the Orthodox Church fully in all that it has to offer. After all, after 2000 years, Orthodoxy is still vibrant and its teachings are unending and relevant. We just need to make our faith our number one priority in our lives. God first! We need to become the bait that Christ would want dangling from his hook in the waters of life. Quit hiding behind excuses! Jesus said to Simon, “Cease being afraid; from henceforth thou shalt be taking men alive.” [Luke 5:10] Don’t you know that you belong to the team THAT CAN!! Grasp a hold of all that Orthodoxy has to offer, Cling onto Jesus, and jump into the water and be vibrant. We have all been called and we are all needed! Don’t become a piece of dried up smelly bait left behind in the compost pile of life, CATCH FISH! Glory to Thee, O Lord; Glory to Thee!